Everyone eats well in Belgium. So they say. There’s even a cookbook by that name. Having been there numerous times, I can attest to the quality of the food. Belgium is really two countries in one: Flanders (speaking Flemish) in the north and Wallonia (speaking French) in the south. Brussels bridges them. While geographically part of Flanders, Brussels is predominately French-speaking in my experience although it claims to be bilingual. I am most familiar with the northern country, around the medieval city of Antwerp and branching out to Ghent and Bruges. Waterzooi is one of the characteristic dishes of the region. It’s a cross between a soup and a stew, poaching ingredients slowly in liquid (“water” means water – no surprise — and “zooien” is synonymous with boiling). The traditional dish can be made with fish or chicken. I’ve had both in Belgium but this time, I decided on chicken. The typical vegetables are onions, leeks, carrots, celery and potatoes. For the dark days, I chose a small celery root. The most common cooking method that I know is to poach the chicken in stock with the vegetables, remove the skin and shred the meat, finishing the dish with an egg yolk beaten with a little cream, as you would do for a blanquette de veau in French cuisine. My preference is to poach the chicken separately, remove it from the stock and chill both. This yields more meat and stock than I would use for four. Just increase the vegetables and chicken to serve more. After de-fatting the stock the next day, I poach the vegetables in it until tender, add shredded chicken, and finish with the egg and cream. You can make this in advance and it improves in flavor, so it’s good for parties. Just make sure not to boil the liquid after the egg-cream mixture is added to avoid curdling. This feels very spring-like and would be great with fresh peas and tarragon. 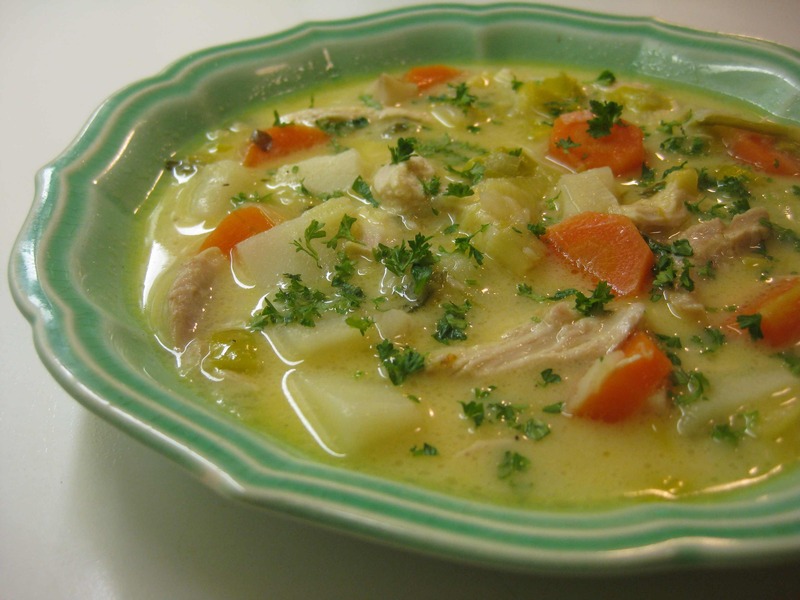 The day before you plan to serve the waterzooi, cut the chicken into pieces and place in a deep stockpot. Add chicken stock and water to cover. Bring to a simmer and cook slowly for about 40 minutes or until the chicken meat is tender and barely cooked through. Remove the chicken to a platter. When cool, remove and reserve the meat and return the bones to the stockpot, adding the optional vegetable trimmings. Bring the mixture to a simmer and cook for about 40 minutes. Remove the bones and vegetables if using, and let the stock cool. Refrigerate it overnight. Remove the layer of fat that rises to the top. When ready to make the waterzooi, sauté the chopped onion slowly in the butter or ghee. Add the leeks, carrots and celeriac and stir to coat. Ladle in 4 cups of chicken stock and simmer the vegetables for about 15 minutes. Add the potatoes and cook for another 15 minutes or so until the potatoes are tender. Season with salt. Add about 1 cup of shredded chicken meat (more to taste) to heat through. With a fork, mix the egg yolk and cream thoroughly. Add a little of the warm stock to the mixture and then combine with the ingredients in the pot. Simmer, but do not let the mixture boil (it will curdle). Serve hot in bowls sprinkled with minced parsley.